D&D using the MEGS rules was recently discussed – here is a MEGS player character that I recently found cluttered on a worn, old Palladium RPG character sheet and which I used in our Palladium-DC campaign in a world and setting identical to that of the Palladium Fantasy RPG, but using MEGS rules. This was our most low-powered campaign ever. All in all, we had Hero-DC, Crime-DC, Cosmic-DC, Apocalypse-DC, Space-DC, Agent-DC, Magic-DC, Palladium-DC and others and would have started Stone Age-DC and Wild West-DC, but never got around to the latter two. Crime-, Apocalypse- and Magic-DC were the overwhelmingly most popular ones and therefore have rich campaign worlds with numerous adventures and characters that will one day be shared through this mailing list. Comar fights hard, tough and effectively using melee weapons with little finesse. His mirth is contagious and boosts the morale of those fighting with him. While not yet a true veteran he has access to an assortment of useful skills including first aid, riding, climbing, stealth techniques, but, in particular, weapons use. 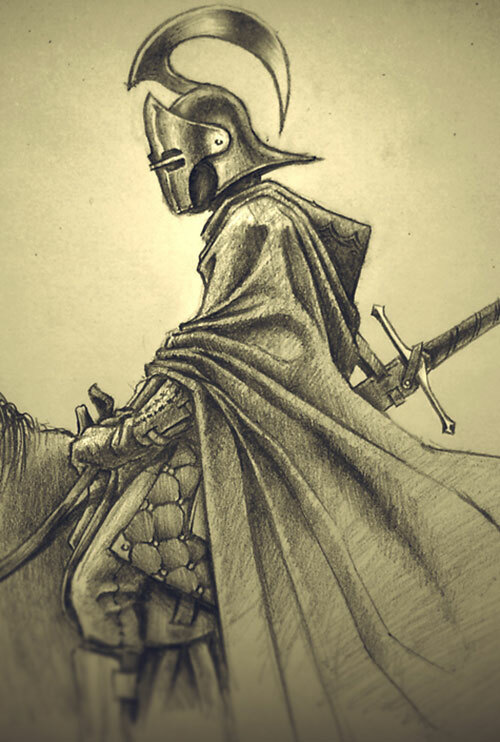 Little is known of Comar’s background, except that he seems to have belonged to a class of lower nobility in the Western Kingdom with aspirations for knighthood. Comar was a Captain in King Harald’s Honor Guard and well-known for his combat prowess with melee weapons and inspiring leadership if little else. The otherwise little experienced Comar was then put in charge of a hastily put together rescue expedition to save King Harald’s kidnapped young daughter for which the King had received a ransom note. After following tracks in a rainy storm to a hideout in a cave and putting down hordes of measly warriors the final guardian, a powerful Minotaur renown for cleaving its opponents, often vertically using a double-axe, was encountered. The Minotaur cut down most of the remaining rescue team in bloody combat, but its threat was permanently ended when it received a taste of its own medicine as it was cleaved vertically by the leader of the team, Captain Comar. The king’s young daughter was returned safely and Comar’s fame grew exponentially. As a reward for services well rendered Comar was promoted to Major and then personally knighted by the King and granted the title of sir. Comar also received a small castle at the outskirts of the King’s Empire, his grand home to this day. While having no regular income, other than what is granted by his friend the King, he keeps regular feasts at the castle where good food, beer and wine is abundant. Comar stands ready for new orders and adventures at the whim of the King! Major Comar is a large, muscular man wearing a beautiful black full plate armor ornamented with colorful craftings (which actually are magical runes enhancing the armor’s protective capabilities). Comar also wears a red cape and is often seen carrying his broadsword on his back while riding his horse. Always ready, Comar often wears the armor even in his spare time, which is spent practicing combat, feasting on wild boar, pheasant, potatoes, goat milk, mead and wine. Major Comar has a loud personality as he believes in honor and glory and the good fight. Fight hard against the forces of evil and celebrate hard could be his adage. He is very fond of the concept of a good fight and the rule of the strong, and will guide his forces quite effectively in putting down magical menaces, monsters, evil men and other threats. Comar enjoys directly serving the king and believes in doing as good as possible a job at it. The Western Empire should be renown for its fine combatants, its wealth and capable leadership, and Comar will see it happen. Comar owns his own castle, which one day will rival that of his master, King Harald, whom he will one day amenably leave, not betray. His court is growing every day, but Comar often goes on adventures to become the man that he can be, the legend that he is, and the myths that will be told about him. 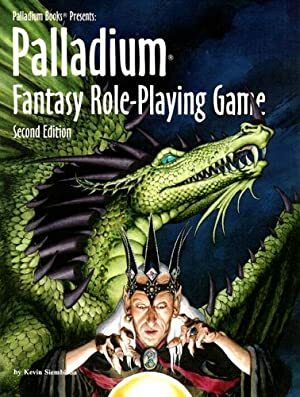 The characters were made for only 225 HPs (the Player characters start basically as normal human folks) and so surviving mythic adventures and fighting legendary monsters and creatures was really hard but fun! The Player characters were any one of a chosen class with a prioritized Subskill consisting of: Wizard (One Occultist subskill or one Power), Thief (one Thief subskill), Knight (One Weaponry subskill), Ranger (One Military Science subskill), Acrobat & Tumbler (One Acrobatics subskill) or Assassin (one Martial Arts subskill). The prioritized Subskill would often also be the Player characters highest Subskill. The following Skills did not exist for default characters in the campaign: Artist (Photographer), Medicine (Forensics), Military Science (Electronic Countermeasures), Thief (Security Systems), Vehicles (Air, Space). Some default skills, like Demolition and Firearms, would be extremely rare. A complete Skill could be raised with all subskills included by paying a Cost equal to the averaged AP-level of all the subskills. This genre actually takes 15 HPs for possessing Mystical Attributes, leaving the characters with even less HPs at creation! The Ranks used in the King’s army are in ascending order: Private, Corporal, Sergeant, Lieutenant, Captain, Major, Colonel and General. While the campaign did not automatically involve membership in the King’s Guard it was recommended as it offers many good starting points for the adventures. Writeup completed on the 16th of June, 2014.